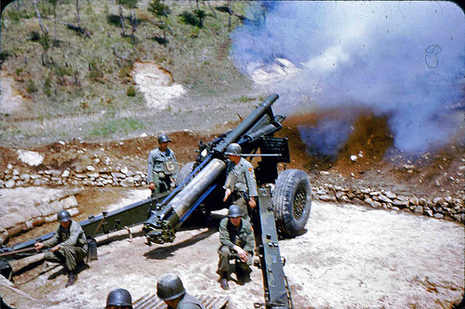 The Battle of Triangle Hill, also known as Operation Showdown or the Shangganling Campaign (simplified Chinese: 上甘岭战役; pinyin: Shànggānlǐng Zhànyì),[nb 2] was a protracted military engagement during the Korean War. 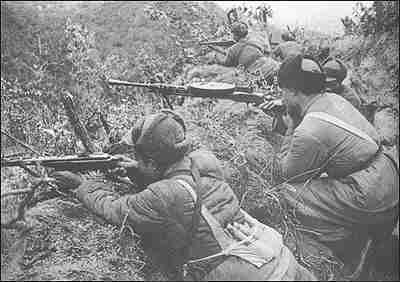 The main combatants were two United Nations infantry divisions, with additional support from the United States Air Force, against elements of the 15th Corps[nb 3] of the People's Republic of China. The battle was part of American attempts to gain control of "The Iron Triangle", and took place from October 14–November 25, 1952. 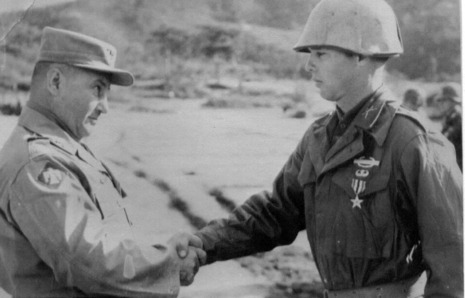 The immediate American objective was Triangle Hill (38°19′17″N 127°27′52″ECoordinates: 38°19′17″N 127°27′52″E), a forested ridge of high ground 4 kilometres (2.5 mi) north of Kimhwa near the Korean Demilitarized Zone (DMZ). 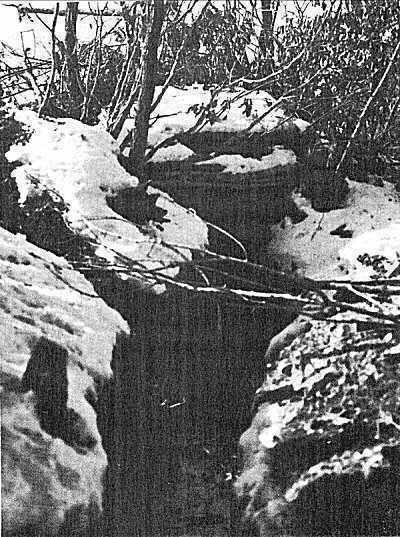 The hill was invested by the veterans of the People's Volunteer Army's 15th Corps, who had gradually withdrawn to elevated positions over the previous months. 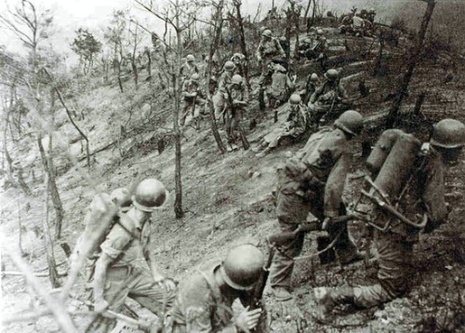 Over the course of nearly a month, substantial American and South Korean forces made repeated attempts to capture Triangle Hill and the adjacent Sniper Ridge. 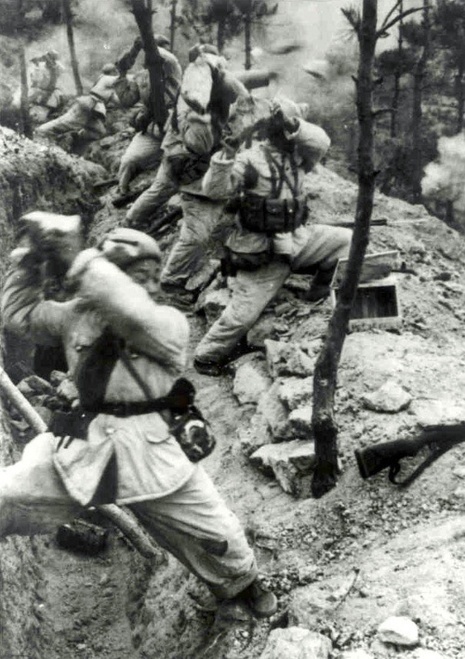 Despite clear superiority in artillery and aircraft, escalating American and South Korean casualties resulted in the attack being halted after three weeks of fighting, with Chinese forces regaining their original positions. 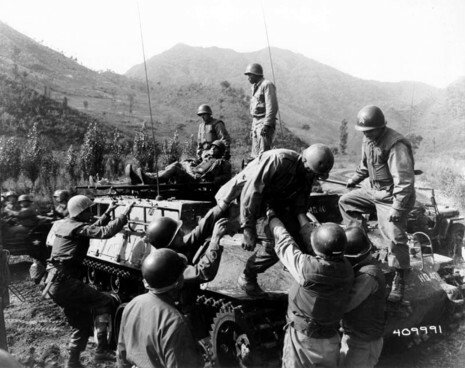 In October 1952, the U.S. 7th Infantry Division occupied a sector of the Main Line of Resistance (MLR) in central Korea near Kumhwa. 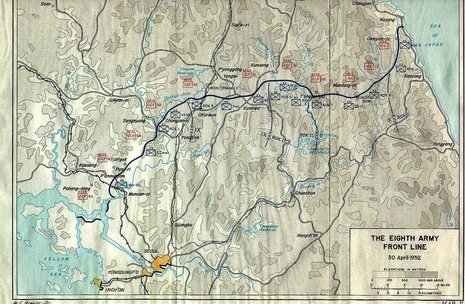 Opposing the division, the Chinese 45th Division held elevations to the north, including Hill 598, also called Triangle Hill. Both sides were well dug-in. Battle lines had not changed significantly in almost a year. After peace talks began in November 1951, the Eighth Army assumed an "active defense" posture and combatants on both sides marked time awaiting the outcome of the talks. The "War of the Hills" had begun. For six months, this war played out as artillery/mortar exchanges and minor skirmishes that did little to change the situation. Then, in spring 1952, as frustration over the failure of peace talks increased, "active" defense gave way to active engagement. Operation Showdown began to take shape.